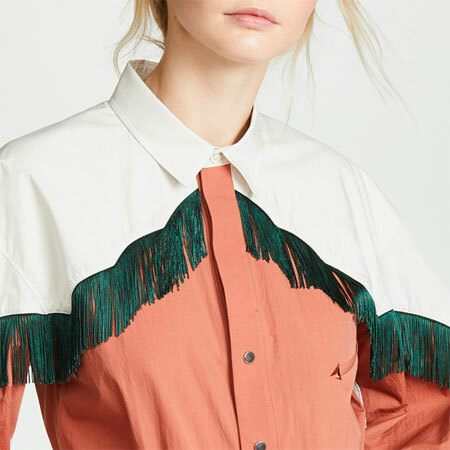 Skirts with ruffles, flounces, pleats, and flares tend to exude a pretty, playful, elegant, precious and soft integrity as opposed to a hard-edged, strict and no-nonsense vibe. That’s fabulous if you like to wear soft and pretty outfits (which I personally do). If it you don’t, you can easily toughen up the pretty skirt by adding a black support act and toughening up the shoes. Combine an oversized pullover with a flared midi skirt and finish of the look with tailored black heeled boots. They can be short or tall with any style of heel. But keeping them tailored is key because it adds structure to the look. A pullover with a welt adds a little structure too. This straight skirt with ruching and gathers is more bombshell than the rest because it hugs the figure and showcases the contour of the body from waist to calf. The addition of the roomy cropped pullover and flat combat boots relax the bombshell vibe and add some tough. The black items add the harder edge. Feel free to add black hosiery to the outfit. This is my favourite of the three because it’s the prettiest and most tailored version to my eye. 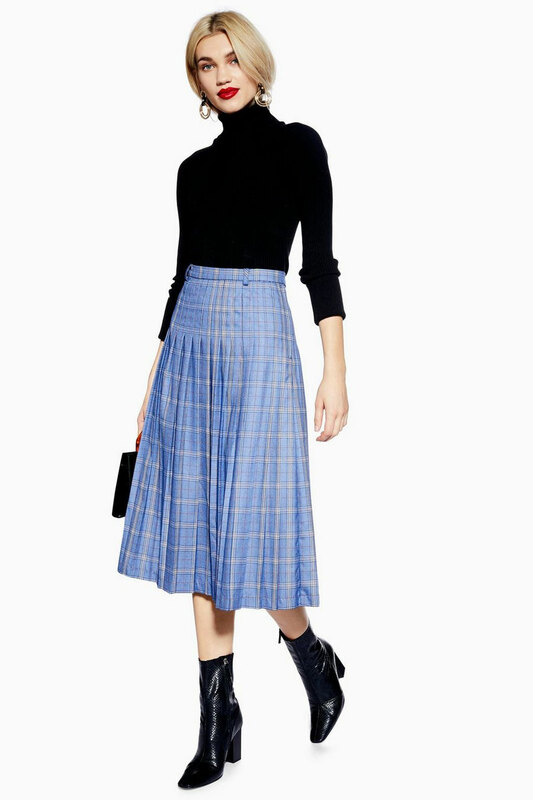 Combine a fitted black turtleneck or crew neck with a fit-and-flare midi skirt. Tuck or semi-tuck the top to showcase the waist. 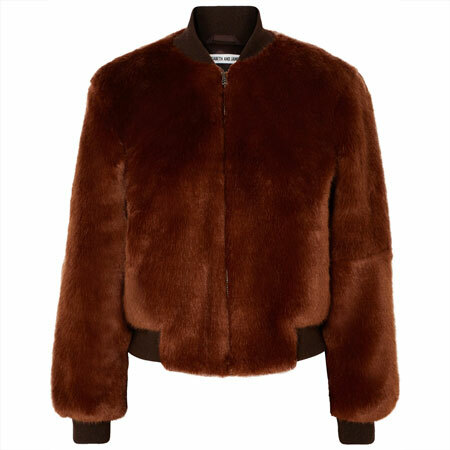 Add black tailored mid-calf or tall heeled boots. The heels can be low or flat as long as they’re very tailored. Patent black boots add a bit more severity too. 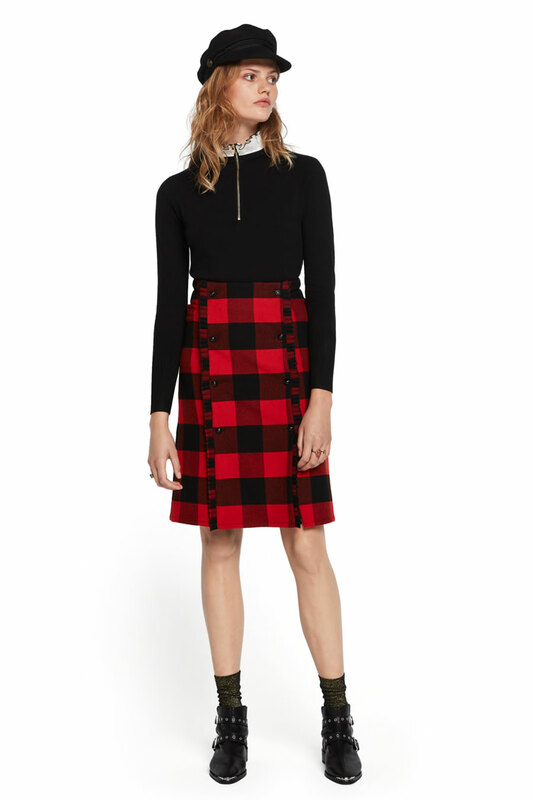 Note that there needn’t be black in the pattern of the skirt because a black top and boots creates a complement that pulls the look together despite the colours in the pattern. This mix is unique and juxtaposed. 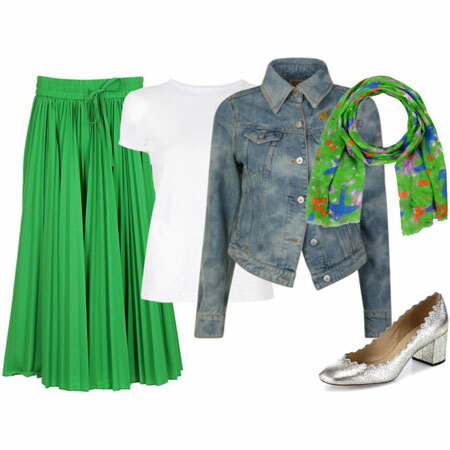 A ruffled top with a sporty zipper is combined with a ruffled A-line plaid skirt. The glitzy flat black boots add the tough and hard edge, as does the black and silver hardware in the outfit. On the other hand, the sparkly socks throw back in some playful softness. Black opaques and black shooties could work too. Hope to see more midi skirts here as well as in the shops in my area. Like seeing these examples; my real life would have few occasions for an elegant version of a midi. Powerful to see how footwear and black can add a bit of edge. Now all I need is the skirt. That’s great! I bought two pleated skirts end of last year… not really my style, so a little short on ideas… but they were pretty! One of my favorite ways to wear skirts, except the bare legs between skirt & boots looks awkward to me in all but the last one. In summer with Short sleeves, maybe, but I’m more likely to wear shoes, like loafers, in the summer. If it’s cold enough for boots & is sweaters, I’m going with tights on my legs. FashIntern, I can’t get on board with the high shaft bootie-bare leg-midi skirt thing either! But otherwise I love all of these. I wore multiple iterations of #1 in the actual 90s except the footwear was much clunkier. Hoping to see pretty maxi skirts make a comeback in stores this year, as I also love wearing them with sandals in the summer. I just discovered that I have an issue with belt loops that aren’t filled in by a belt, thanks to photo #3. What!?! Now I’m going to drive myself batty by noticing that everywhere, lol! I have a DVF black lace scotia pencil skirt (I think it was an NAS recommended find a few years back). I tried it with everything in my closet but I like it best, just as you suggest, with a plain black turtleneck or a ribbed fitted silk tank, totally sleek and simple. A sleek suede aquatalia bootie or my new All Saints Lucie elegant combat or new frye sacha Chelsea. The prettier the piece the more I need to sleek and minimalist it down and toughen it up. I just can’t do full on pretty, it’s so not me. I love #3 Classic Fabness the best too! I appreciate the tailoring and conventional figure flattery of the silhouette. It works well for me and how I want to be seen. I want to be taken seriously in my business, but I also want to show a soft, approachable side. This is a great formula for me! Thanks Angie! Love #3, and I could make it work with my Halogen striped pleated skirt, black turtleneck, and the Jeffrey Campbell Luzbel booties I bought in December. Will try this once it warms up where I live! I like the more casual vibe of these but rarely wear skirts these days. If I run across a midi skirt I can’t resist this could give me some ideas though. The first one is a fun look and does really remind me of the 90’s. I wore a version of #1 to work yesterday – first time I’ve had a skirt on in years – and while I liked the idea, I wasn’t happy with the lack of structure(my sweater was too big and loose) . Need to find a better sweater . The outfit was black on black, which was fine, but I should maybe have worn sheerer hose and had some arm skin showing somewhere to lighten it up. Loved the skirt though and will definitely be looking to style it a little better next time. You had me at fitted black turtleneck, I love #3! Wondering if there is a formula for how much leg should show between booties and skirts? I struggle with the proportions when I try to pair a skirt with booties. I really like the Combat Bombshell look. How did they orchestrate the ruching on that skirt?! Could you explain what you mean by “tailored” boot in #1? Is it the pointed toe and lack of embellishments? My closet is FULL of pretty skirts, black tops, and black boots, and you know these are just my style. Now if only the weather would cooperate! Love these! I wish I could wear skirts for work! Thanks for sharing. 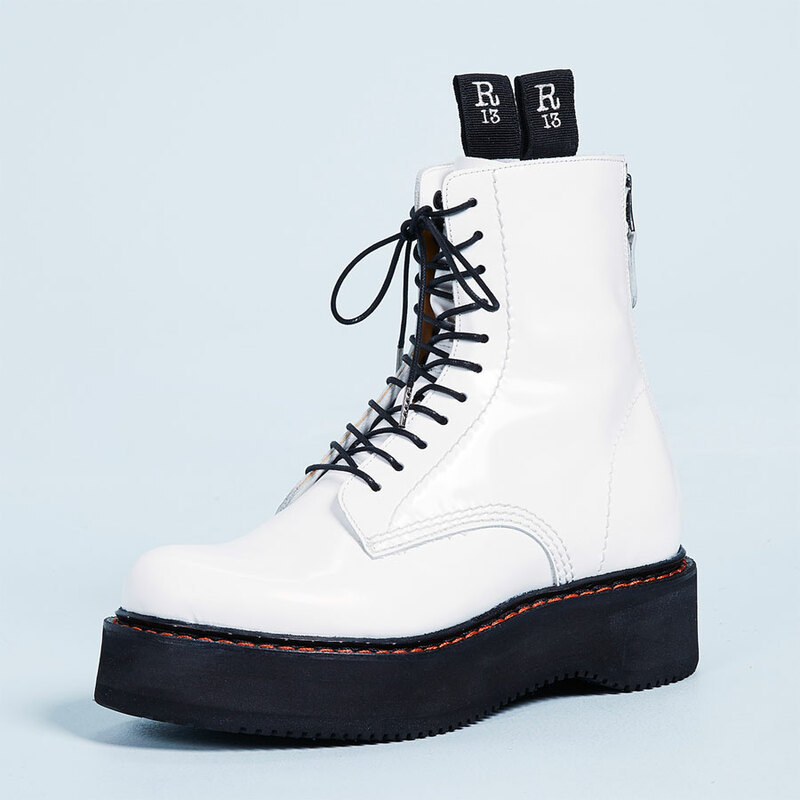 But, if I was to ever own combat boots, I’d have ones like #2. Streamlined and with zip! Fun to hear your enthusiasm for the look. The Cat, sure. You can wear a fitted or cropped top untucked with #3. Midis are all over the runway – (have been for years) – and are finally trickling through to retail. My favourite! Eliza, HAH. That would be a good place to start. Rachy, lets see those cute new skirts. FashIntern, so with on wearing hosiery for warmth. Sonce, YES. There were lots of midis in stores for Spring and Summer last year, actually. Are you in the US? Gryffin, I remember that stunning skirt, and like the way you’re styling it to suit YOU. I’ll wear head to toe pretty for you, and you can wear head to toe black for me – deal? Kathie, oooooh, yes. Sounds fab. RobinF, we’re seeing a gigantic throw back to the ‘90s this year especially. Lisa P, is that the new flared skirt you were talking about last week? I like hearing you wore a skirt! Colette, HIGH FIVE. I love a fitted t-neck too. Throw in the hose, and it solves the problem. Kim M, it’s a work of art. Nemosmom, YAY to de-orphaning your skirts. We can throw the brown boot topic around on the forum, if you like. Tailored boots fit very snugly on the foot and lower leg. No gaping and structured, although a few embellishments are fine. The booties in the last outfit are NOT tailored, but they cheated us into thinking they are by adding scrunched socks. Diana, you OWN this look. Rock on. Suntiger, nice subs to suit your tastes. That’s what it’s all about. 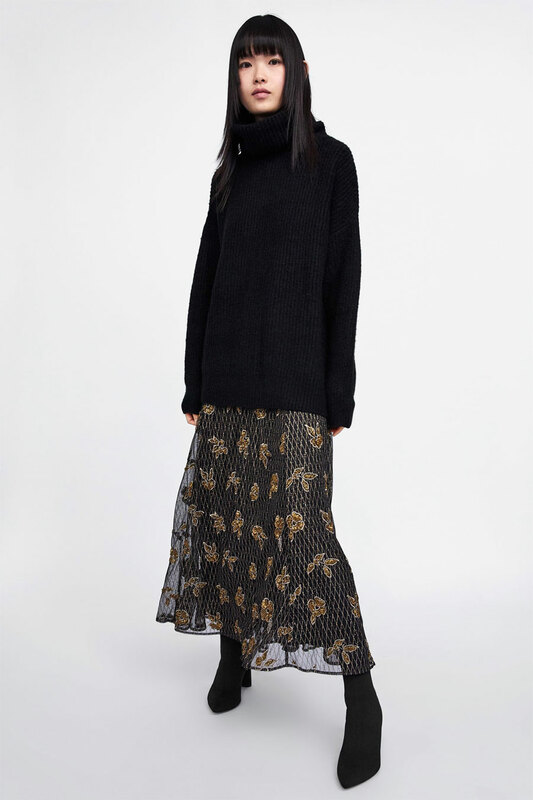 A black turtleneck and skirt like in #3 used to be one of my favorite combinations. I haven’t worn it much lately, but I have the perfect skirt. My turtleneck is old but still going strong (and I haven’t found one I like better) so maybe I’ll try to wear this combo next week. Yes! New skirt in finds. 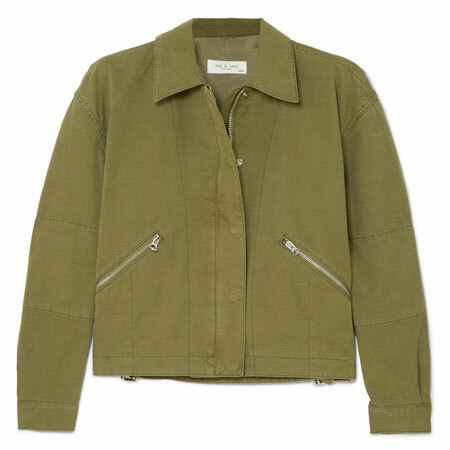 H&M on-line only. Love it!! The 90’s look is well remembered but I like #3 the best. 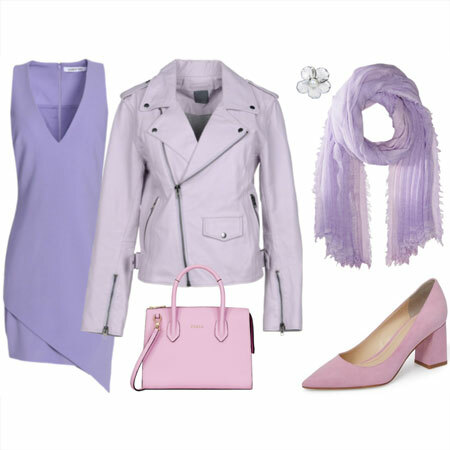 These ensembles will work well for a cold spring day. I have a couple of thrifted black turtlenecks with banded bottoms that are probably from the 90’s and perfect with skirts. Thank you for these great ideas. I have a skirt very much like #1. I wear it with a sleek black turtleneck and a dainty heel. I love a hard edged look , but not so much through my footwear. Although these aren’t too extreme and are actually quite doable for most! Thanx for great examples ! Lisa P, this one with the elastic waist? Nice drape. No tucking with that guy! Sara L and Joy, excited to see your renditions. Cheryl, nice to see you pop in. Hope you and the doggies are surviving the Polar Vortex. Lovely skirts outfits, I am smitten with #3, I wore that type of skirt and had a couple of them a long, long ago , nice memories. I also like #4. Much love for #s 1 and 2. @Angie yes I am in U.S. but I was still plus-sized last year and on very limited budget. So the skirts were probably there but I couldn’t fit and/or afford them! Still on a limited budget, but now a misses 10/12 so hoping to have more options. I’m inspired to try a skirt. I like these longer lengths. Yes. Wide elastic waistband that could be shown if you wanted to tuck. Lies nice and flat, and the fabric is a heavy satin back crepe with wonderful drape and great double topstitched seaming. I’m really liking it and will be seeking out better tops/jacket to wear with it. Sonce, I bet you’ll find what you want this season. Feel free to ask the forum for help too. Lisa P, looks like a fab find. I’ll make it a top pick. I LOVE #2. Any suggestions for a similar style in plus? I love these SO much! 2 and 4 are my favourites. No 4 makes me want an a-line plaid skirt. I like 3 too but I’ve yet to find a pleated skirt that suits me. I’d do it with an asymmetrical midi and untucked top. No 1 is a little too unstructured for me but I could do something similar with a more cropped, boxy sweater. Thanks! I’ll keep these in mind for when the weather gets cooler. At 5’4” midi length always feels a bit frumpy on me. Love the length on the models. Glad to see I’m not the only one who finds the high boot and bare leg proportions to feel awkward. Tights would make that work for me. I’ve been really wanting a knife pleat skirt and I like the fitted look of # 3. #1 looks super fun. I love that the skirt covers the top of the boots, gives it a kind of ’70’s vibe, and the oversized top is a nod to the ’90’s. Also hoping that midi skirts will show up in the stores! I’m loving the skirt outfits you’re showing us lately, Angie. I wore a version of #3 today: a swingy camel box-pleated midi, with black crewneck, black tall riding boots, and a big printed challis scarf. Love the classic fabbers and eclectic plaid. In fact, they’re all working, but these two in particular. Classic fabness, but iPhone preferred fabbers. I like these and could do adapted versions. May even try a summer one tonight! This is formula that I often wear – sweater, skirt and boots. Number 3 is my favourite too. Whilst I like #1, I find the volume can be overwhelming on me. My closet is also full of pretty skirts that I have not been wearing. But alas I’ve abandoned all black. It does not make me happy (or spark joy). I’ll try versions of 1 and 3 without, but fear it won’t be the same. I don’t wear skirts much, but these seem pretty easy to achieve. I would wear tights with them though. I don’t like the bare leg in winter. ‘Tis a timeless classic look. …Not counting parachutists and bungee jumpers !! Happy to hear the enthusiasm for the look. Hope to see renditions on the forum. Those are some nice picks. I remember wearing tunics over long skirts back in the day in college. Everything that’s old is new again. There’s a resurgence of ’80s and ’90s looks for sure.